THE REVIEW: This is a film about writers, experiences, and the effects love can have. It’s filled with romantics — Rusty Borgens (Nat Wolff) and Lou (Logan Lerman) — as well as the cynics, or realists, as Samantha Borgens (Lily Collins) likes to point out. Rusty and Samantha’s father, Bill Borgens (Greg Kinnear) is a bit of both, pining after his ex-wife Erica (Jennifer Connelly) hoping she comes back to him while also trying to move on with help (and benefits) from neighbor Mrs. Wilcox (Kristen Bell). 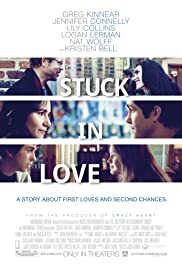 Stuck in Love has many great relationships — both romantic and familial — as well as individual characters and a few plot twists. One might see this film and shrug it off as just a plain, standard, romantic dramedy (more comedy, but still a fair bit of drama) that isn’t too special. Many critics thought so with a few choice quotes from Rotten Tomatoes including, “Perfectly adequate” and “hews slavishly to Hollywood formulas.” But there’s something about Stuck in Love that makes it special and worth watching: it hardens the romantics and softens the cynics. Early on in the film, Bill tells his son Rusty that by the age of twenty a writer has enough experiences to last their creative lifetime. Rusty however, who’s shy, introverted, and risk-averse, hasn’t had these experiences yet so his father tells him to go out and get some. On the other side of the coin you have Samantha who has a lot of “experiences” but who doesn’t believe in love or long-lasting relationships. Over the course of the film, they each learn a bit about the other side. Rusty takes a chance on Kate (Liana Liberato) and Samantha hunkers down with Lou (Logan Lerman). What’s special about Stuck in Love is seeing these characters go through these changes. The plot points themselves may be recycled and a tad predictable, but the phenomenal acting from the entire cast makes the reactions fresh and unique. THE TAKEAWAY: So while this film may not be the most original tale about love you’ve seen, the execution and the performances make for a touching and worthwhile film. And it’s not all repeated storylines either, there are plenty of surprises too including one which I wasn’t expecting at all. Stuck in Love makes for a great Valentine’s Day film or a great choice whenever you want to get your rom-com fix. And above all, it leaves you with hope. The message the film leaves you with at the end is a testament to love and a reassurance that while you may go through some tough times, while you may be scared or unsure of what will happen, in the end love finds a way to win.